I was browsing through this excellent presentation given by Dave Astels and David Chelimsky at RubyConf2007. 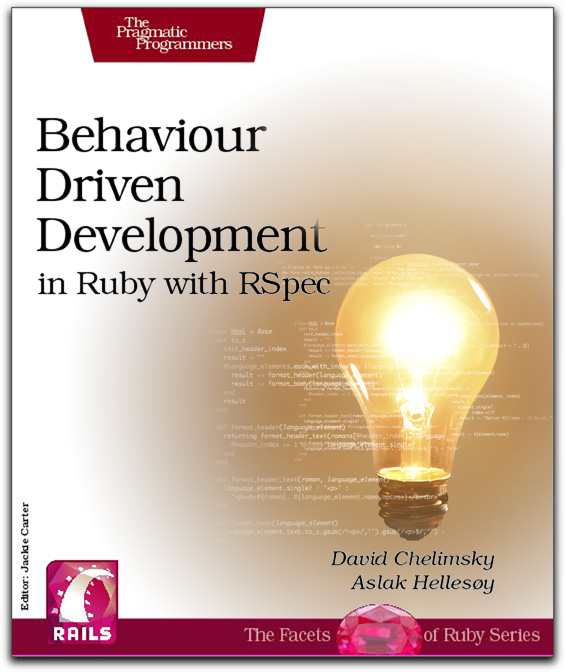 Turns out that David Chelimsky and Aslak Hellesøy are working on a book about Behaviour Driven Development using RSpec. The presentation is an excellent introduction for anyone thinking about moving to RSpec. It tells you a bit about the (rather short) history of the framework and the differences between BDD and TDD. It also shows off the awesome plain-text stories I posted about earlier. I’m currently doing an internship as a final part of my study. Luckily I’ve been able to find a company where I can use Rails to create a new application. One of the choices I made for the development is the use of BehaviourDrivenDevelopment (BDD), which is a variation on TestDrivenDevelopment (TDD). Rspec is a BDD-framework for Rails. It features a beautiful way of expressing the expected behaviour of your application. It takes some discipline to strictly follow this pattern, because a future piece of code might seem so trivial, that you want to code it immediately. Writing the specifications like this takes some time, but you’ll easily make up for it while you’re coding your application. 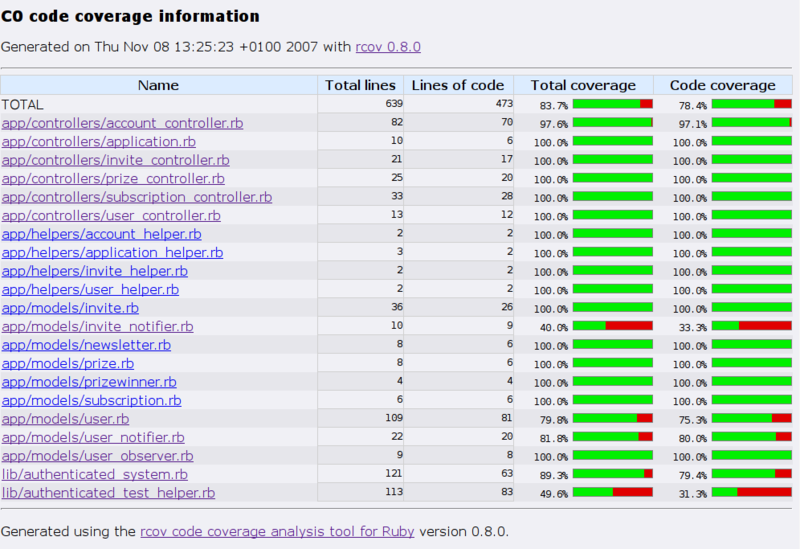 You can use Rcov to check if your specifications cover all your code. When your specifications cover all your code with sensible tests, you can easily refactor your code, because the specifications will make sure your new code works properly. In combination with AutoTest, BDD is already saving me a lot of time during development. Whenever I’ve changed some of my sourcecode or specifications, the specifications get tested automatically. If something breaks, there’s a small error popup, so you know you should check the AutoTest window for the test where it failed. If all tests pass you get a cheerful message.